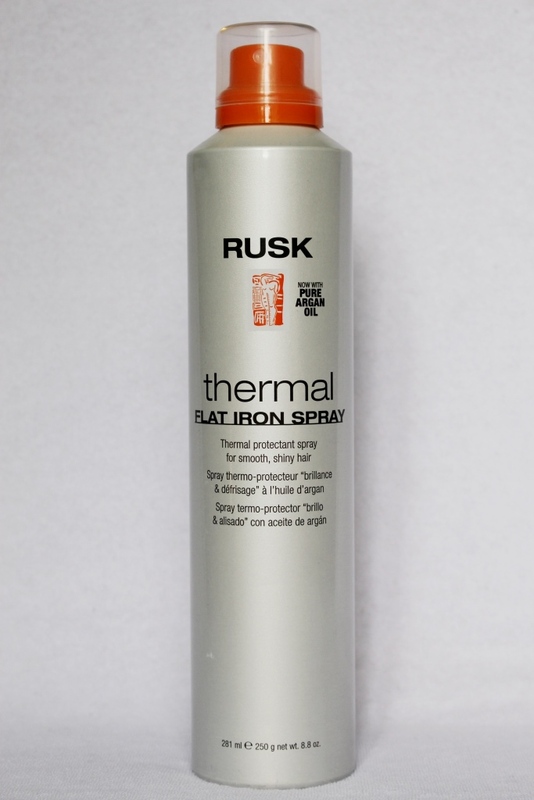 I heard very mixed reviews on Rusk Thermal Flat Iron Spray, but I think that if is used correct, is a great product for keeping the hair straight, shiny and frizz free. I agree that it`s a little heavy and it does feel like a hairspray, but I also think that it does its job as advertised from the company. The way I use it is to section my completely dry hair and comb through each section. Then spray just a little bit of the Rusk thermal flat iron spray on the section and comb through while holding the flat iron with the other hand, following the comb. Does it make sense? I hope it does 🙂 Then spray another section and keep doing the same thing for the whole head. This is how I usually flat iron my hair and now when I use the thermal spray prior that, it makes my hair real shiny, super straight and resistant to frizz and wave. I will not recommend this product to almost straight fine hair, because it may be too heavy, but if you have thick wavy or curly hair that it takes time to straighten, I will say give this spray a try. It also contain Pure Argan Oil and it smells great. Makes hair feel a little stiff, but this is to ensure your hairstyle lasts all day and hair is frizz free even on rainy and humid weather. Product Description: A protective, humidity-resistant styling spray, RUSK® Thermal Flat Iron Spray penetrates hair, infusing conditioning and controlling agents like argan oil and Thermplex™ to seal the cuticle, eliminate frizz, prevent curl reversion, and protect styles from environmental elements. 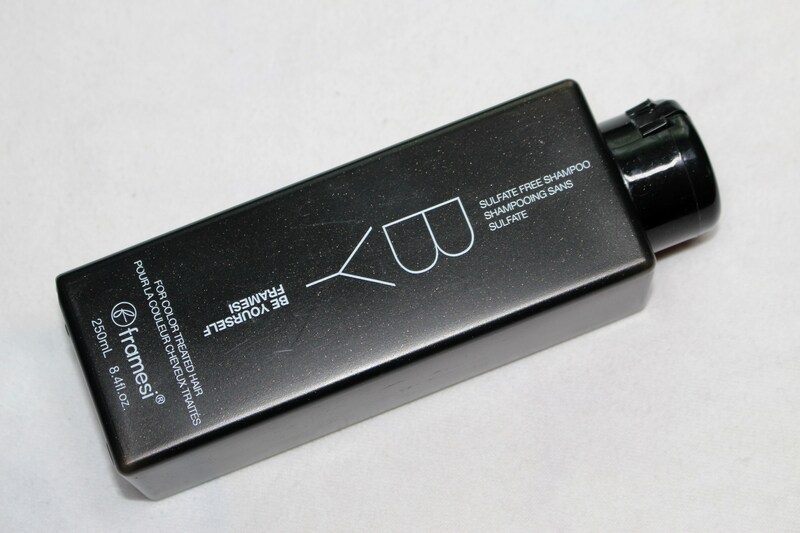 Conditions and protects the hair internally and externally while smoothing and enhancing shine. 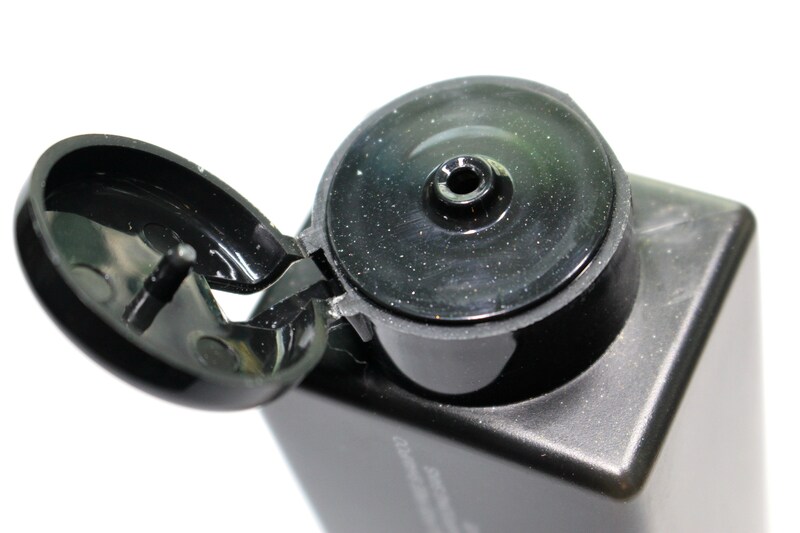 Ingredients: SD Alcohol 40-B, Hydroflourocarbon 152a, Water (Aqua, Eau), Octylacrylemide/Acrylates/Butylaminoethyl Methacrylate Copolymer, VA/Crotonates/Vinyl Nediecanoate Copolymer, Aminimethyl Propanol, Trithyl Citrate, Phenyl Trimethicone, Ethylexyl Methozycinnamte, Cyclopentasiloxane, Phytantrio, Panthenol, AMP-Isostearoyl Hydrolyzed Wheat Protein, Glycine Soja (Soybean) Oil, Dimethicone Peg-8 Meadowfoamate, Fragrance (Parfum), Benyzl Salicylate, Citronellol, Geraniol, Hexyl Cinnamal, Butyphenyl Methylpropianol, Limonene, Linalool. Let`s face it, we are all humans and we all sweat. Some people start sweating more easily than others, while some barely sweat, but still sweat! Even though I am from the people that doesn`t sweat a lot, I still have to use deodorant to prevent smelly underarms. One thing that everyone should know is that a big percentage of the deodorants nowadays have some very bad stuff in their ingredients list, which are harmful for us. Number one thing that you should avoid when choosing a deodorant is aluminum, which increase risk of Alzheimer’s disease and breast cancer. Another ingredient to avoid in a deodorant is propylene glycol, which can do damage to the central nervous system, the heart and the liver. And of course keep your eyes open for parabens and phthalates. There is a natural nontoxic alternatives to deodorants to choose from that actually work. 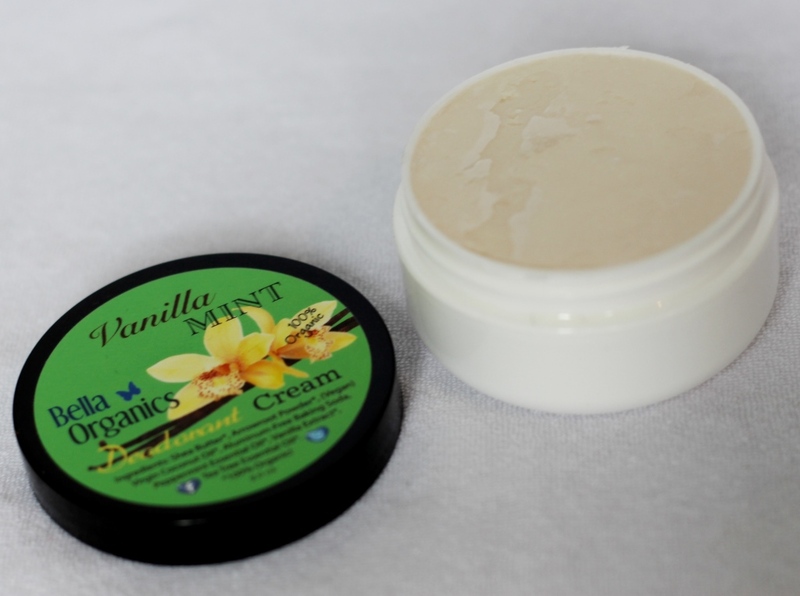 I have been using Vanilla Mint Deodorant Creme by Bella Organics which is 100% Organic and chemical-free. Ingredients: Organic Shea Butter, Organic Arrowroot Powder, (Vegan), Organic Sunflower Oil, Organic Virgin Coconut Oil, Aluminum-Free Baking Soda, Organic Peppermint Essential Oil, Organic Vanilla Extract, Organic Tea Tree Essential Oil. Organic arrowroot powder absorbs wetness naturally. Organic Shea butter soothes and moisturizes dry skin. Coconut oil has natural anti-bacterial properties as well as soothes and conditions the skin. Organic peppermint and organic tea tree essential oils provide anti-bacterial and germ-killing anti-septic properties. 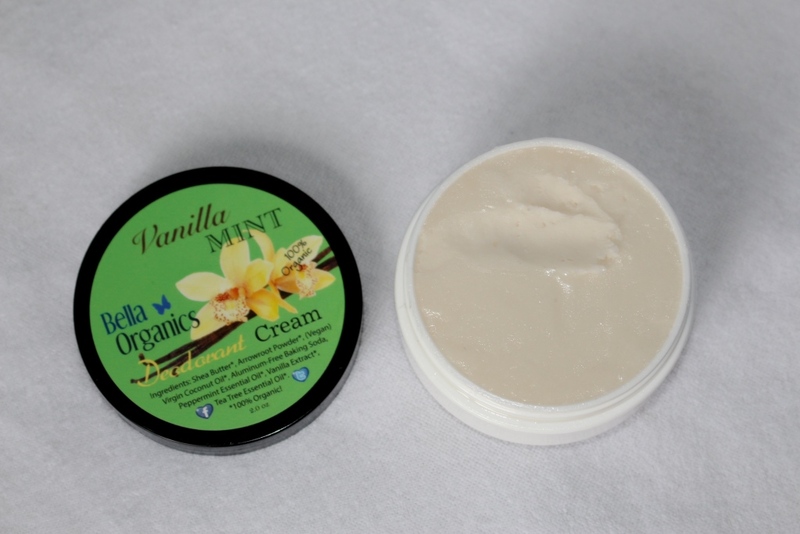 Vanilla Mint Deodorant Creme by Bella Organics comes in a plastic 2 oz round container with a screw lid. 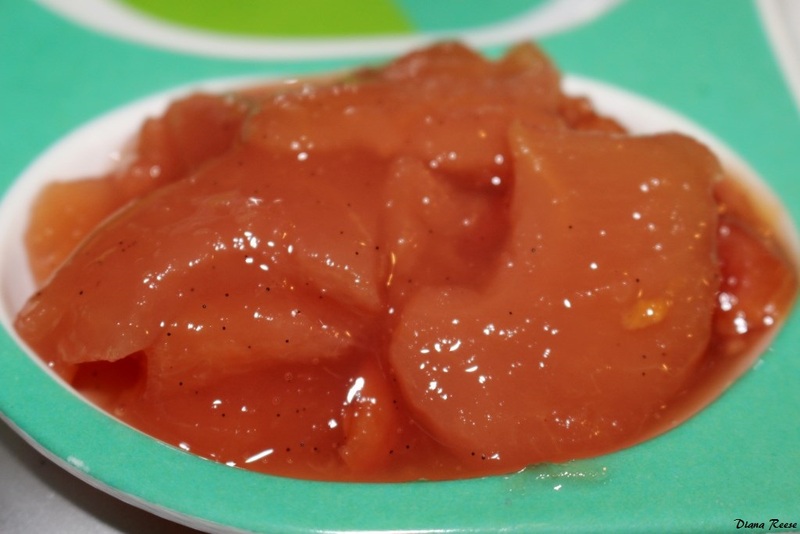 You will have to scoop with a clean fingers from the jar to apply the cream onto the underarms. It has a refreshing peppermint scent and white buttery texture, that has a powdery finish after application. 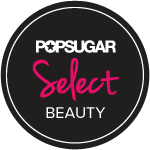 The creme absorbs immediately into the skin leaving it soft, cool and fresh without greasiness or stickiness. I was pleasantly surprised that this product really works and keeps me dry and odor-free for hours. It does leave a white marks from the inside of my shirt, but I don`t really care, because most of the toxic deodorants that we use are not any better. 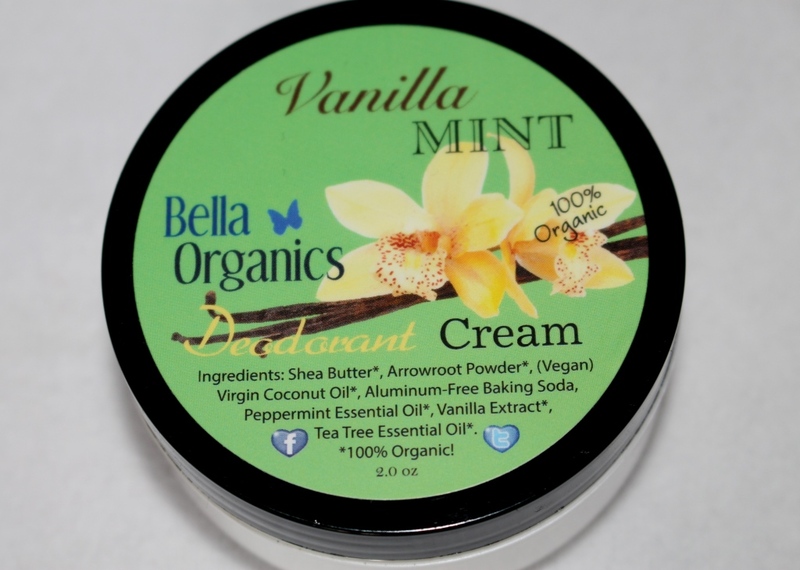 Vanilla Mint Deodorant Creme by Bella Organics is a wonderful all natural product that really works great and I will happily continue using it. If you are looking for an organic, chemical-free alternative to a traditional deodorant I would highly recommend this product and would definitely give it five stars and two thumbs up. 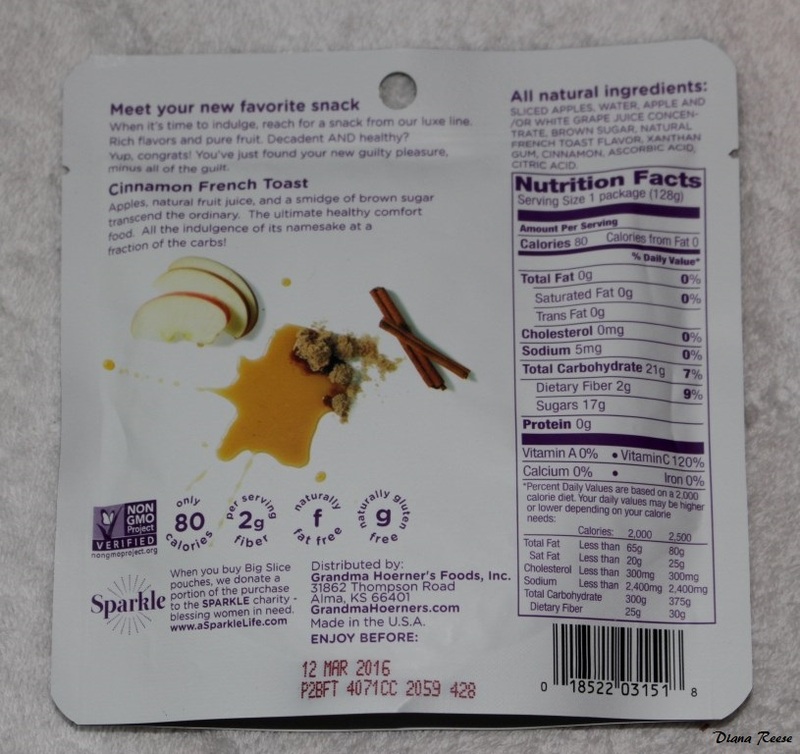 Product was provided complimentary for testing purposes. All opinions are my own and 100% honest. I would never recommend anything that I don`t personally use and like. Dating the wrong men!? I am pretty sure it happens to the best of us. Nothing can help to keep you from getting involved with the wrong man. And there come the questions “Why me?”, “Why again?” wishing it was just a nightmare. 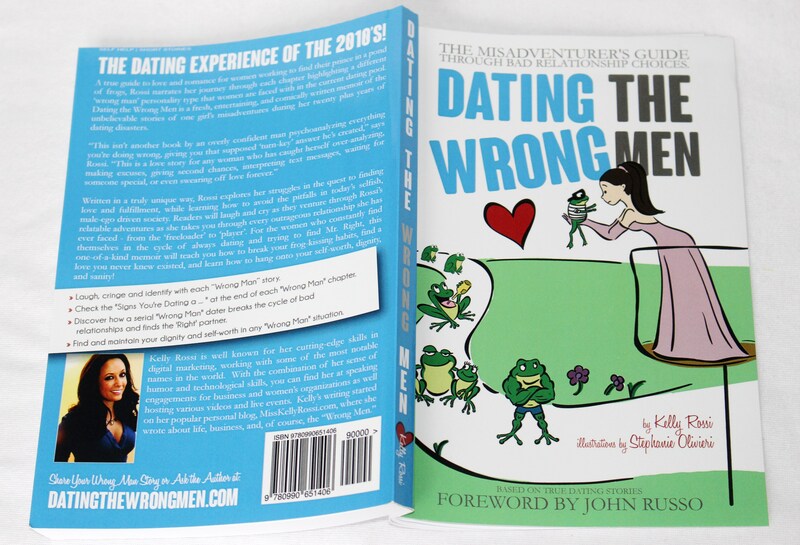 Dating The Wrong Men: The Misadventures`s Guide Through Bad Relationship Choices by Kelly Rossi is a fresh, entertaining, and comically written memoir of the unbelievable stories of one girl’s misadventures during her twenty plus years of dating disasters. 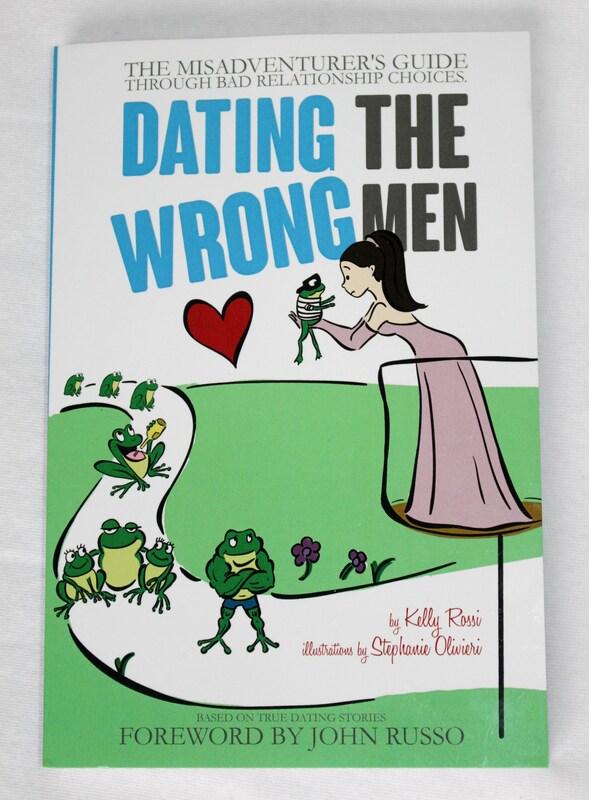 A true guide to love and romance for women working to find their prince in a pond of frogs, Rossi narrates her journey through each chapter highlighting a different ‘wrong man’ personality type that women are faced with in the current dating pool. Introduction: This is a story of a situation, so similar to what most people in the world are faced with today. Women and men who come from broken situations, searching through the sea of broken individuals, hoping for that perfect match that will seal their life into solidity and understanding. This is a love story for anyone who`s caught herself overanalyzing, making excuses, giving second chances, interpreting text messages, waiting for someone special or even swearing off love forever. This is a story of a girl who has dated every wrong in existence and not only lived to tell the tale, but did it without bitterness and found the love of her life in the process. 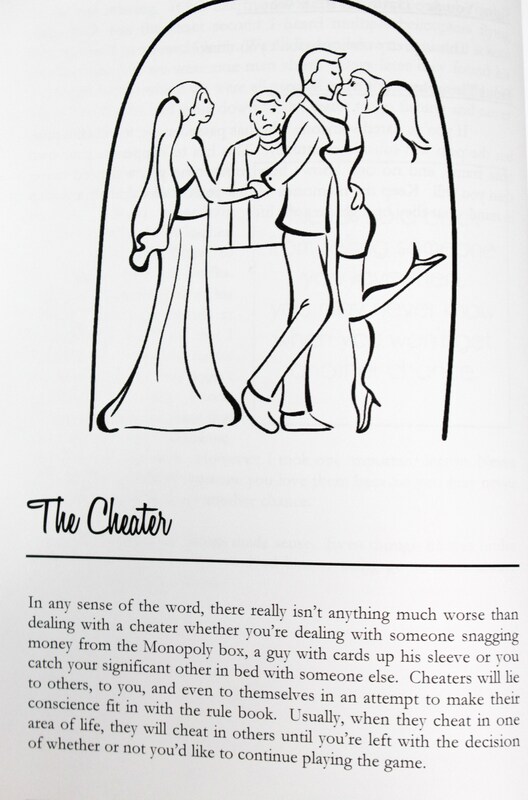 Dating The Wrong Men is very interesting, refreshing and easy to read book with a lovely cover and nice illustrations. The author Kelly Rossi explains her dating life in a nice short stories filled with a lot of feelings and emotions. 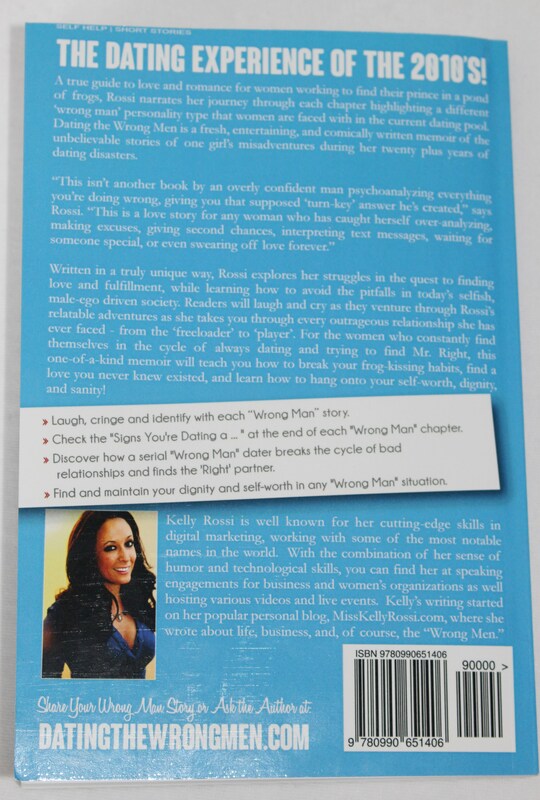 I really enjoyed reading the book, because a lot of the stories match what has happened in my dating life and I am sure has happened to many other women as well. 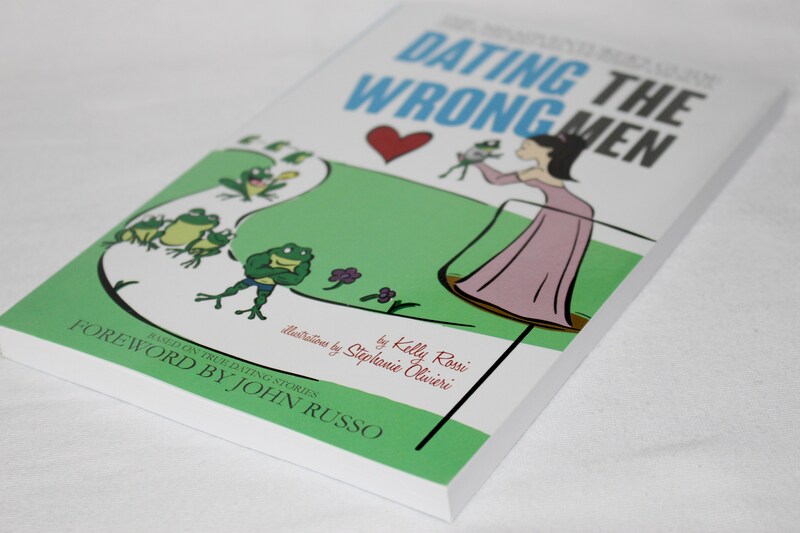 At the end of each story Kelly Rossi shares the Signs of Dating The Wrong Man and also Final Thoughts on Dating this particular type of Wrong Man. If you have a great support system of friends and family, you might have an easier time dealing with the Wrong Men that show up in your life. – Absolutely true! My friends helped so many times while dealing with a Wrong Man. If a man is doing something wrong, he will play the “crazy” card on you. – Absolutely true! It happened so many times! Ever since I was a little girl I dreamed of a day when I would have my own successful business, a loving husband, and a great family of my own. – This was my dream as well! Cheaters get defensive when caught in lies. Think about it, if you were at the store for an hour, would you feel the need to scream that fact at your partner? No, you`d just go grab the receipt and show it to her with the date and time. Trusting relationships have no problem showing the receipts. – Happened before! The phones say it all! Trusting relationships have no problem using each other`s phones. Think back to the days when there was just one line at the house. You never saw someone locking up the line so his spouse couldn`t get on it, did you? 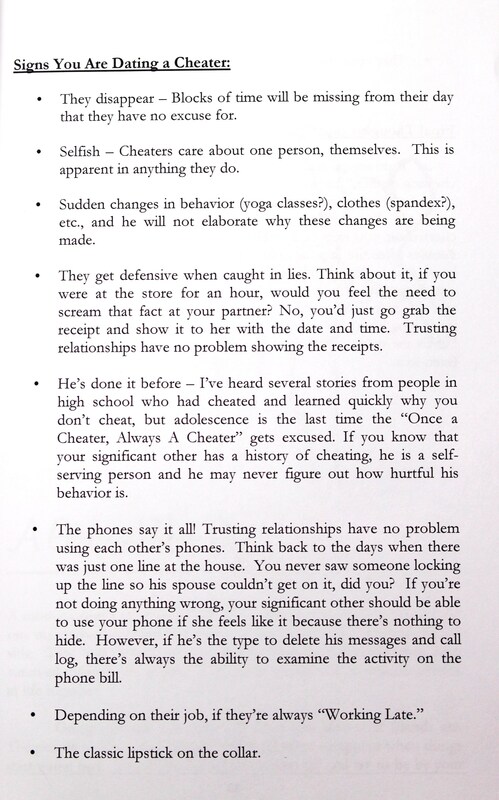 If you`re not doing anything wrong, your significant other should be able to use your phone if she feels like it because there`s nothing to hide. However, if he`s the type to delete his messages and call log, there`s always ability to examine the activity on the phone bill. – I don`t think that I even have to comment on this one! I believe everyone was there before. It`s better to leave a situation that you are constantly questioning what is going on than to stay in it. – I love this one and recommend everyone to follow it! When you have been completely cheated on and are out of a marriage or any horrific relationship, you think it`s only fair that you should find someone right away who will be the knight in shining armor to that horrific experience. Odds are, it`s not going to happen right away. The best things to do is to learn how to get past what happened and figure out how to make yourself happy again. – So true! Unfortunately it takes time for most of us to realize that. If you want anything to change in your life, you need to make some changes. – Exactly! Think about it..
I`ve never been someone who plays games in relationships and have always been extremely straight-forward. Because of this approach, I`ve noticed a hypocrisy in men when it comes to game players. I`ve heard my entire life how men just can`t handle girls who “cause drama” or “play games”. However, once they get together with someone who has better things to do with her time, suddenly they don`t know how to act. They start playing their own games in the relationship to the point where they destroy it. Then, months later, you`ll see them hooked up with a girl that everyone in town calls a psychopath. – Very well said! What some people can`t handle in relationships, others think is no big deal. At the end of the day, it`s knowing what you will and will not accept in a relationship. Anything less than monogamy for me is a no-can-do. – Definitely agree with that! 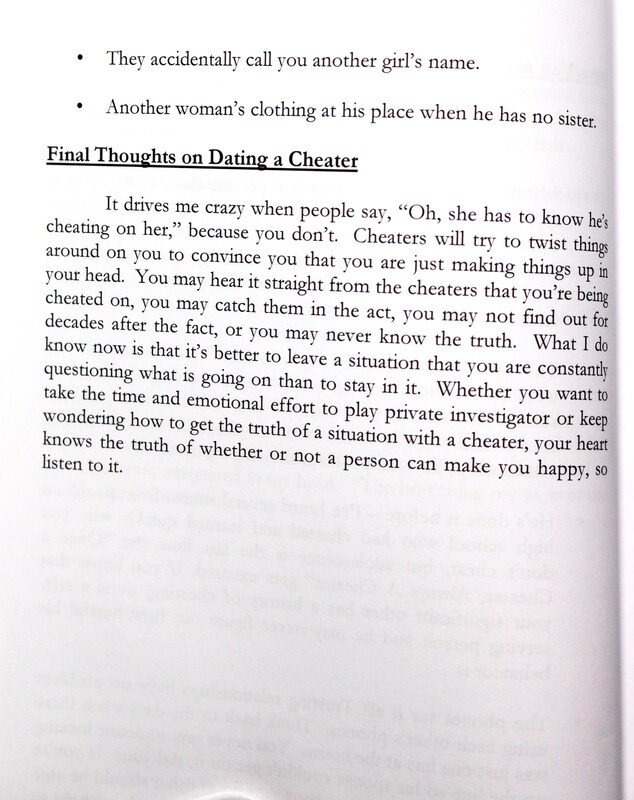 Being with a liar for too long is exhausting and there will come a point where you will want to hang up your Sherlock Holmes gear and find someone you can trust. – I can totally feel your pain. You could meet the person of your dreams at any random locations, at any time, through any person, but you can also meet the ones you wish you never met. – Agree with that. So often, when we look at our dating pasts, we shake our heads and think, “Oh dear God, never let me meet someone like that again!” Even when we truly had a deep love that is lost, something inside us says that there is something better out there. At the very least, it says to show the person that you choose to date in the future some respect and don`t let him ever get it in his head that someone else is even close to the importance he is. – Respect, Attention and showing that you actually care are very important things for any relationship. “This is ridiculous. I`ve never felt like this so fast in my life.” He mumbled and shook his head a million times sitting there, but he eventually said, “It just feels right to say that I love you.” And it was. I said I love you right back to him, and we`ve said it to each other every day since. We could do anything together, go anywhere together, and it was like we were in our own private world. He soon became my best friend and the greatest love of my life. Months later, it finally clicked that he was still there. He really was by my side. It was the first time in any relationship I finally had peace. Along the way I have also met The Abusive Control Freak, The Cheater, a Man Who`s Like a Brother, The Game Player, The Clueless Man, The Junkie, The Married Man, The Liar and one of my best friends definitely married the Freeloader. 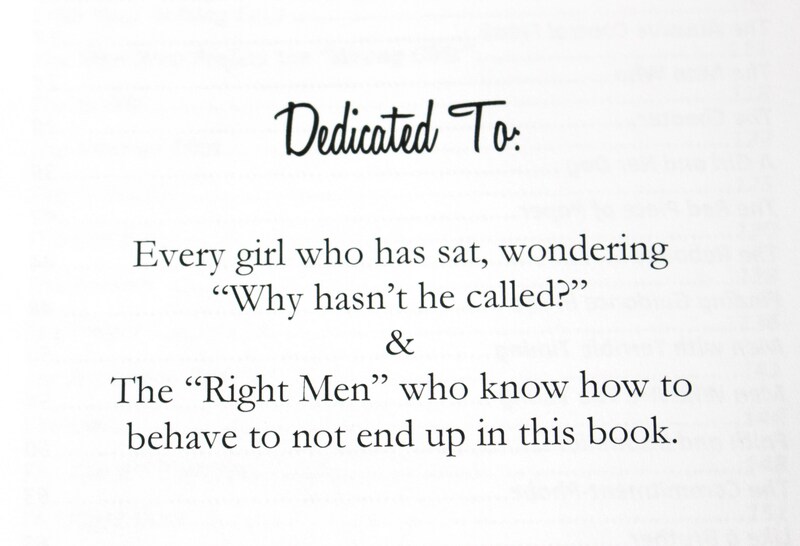 I think that the author Kelly Rossi has done a great job writing this book and I would highly recommend it to all of my friends and any girl in general, no matter age or relationship status. 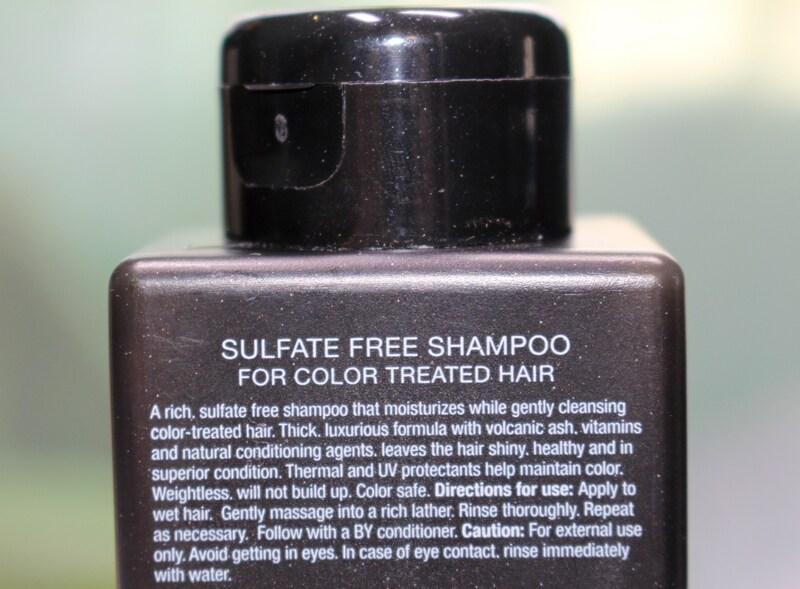 I heard that many people avoid using sulfate free shampoos, because they usually do not lather well and leave a feeling of a still dirty head and hair. I was actually very excited to try a new sulfate free shampoo, because I have a long, blonde and dry hair. Sulfate is known to strip away the dirt and grime, along with the color and all the natural oils away, which cause the hair to appear dull, dry and unhealthy with a lot of breakage. I am using BY Sulfate Free Shampoo by Framesi for a month now and I am quite surprised and satisfied with it. 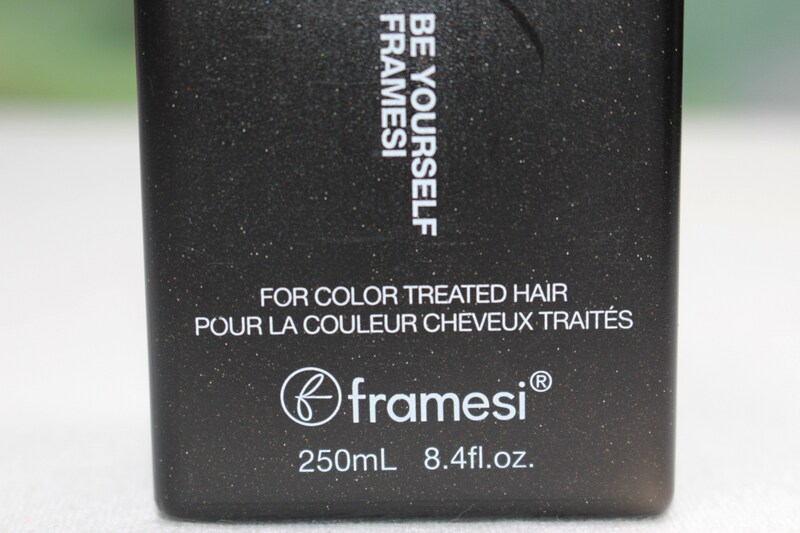 Product Description: Framesi BY (Be Yourself) Sulfate-free shampoo is a luxurious formula with volcanic ash and vitamins. Leaves hair shiny and healthy. 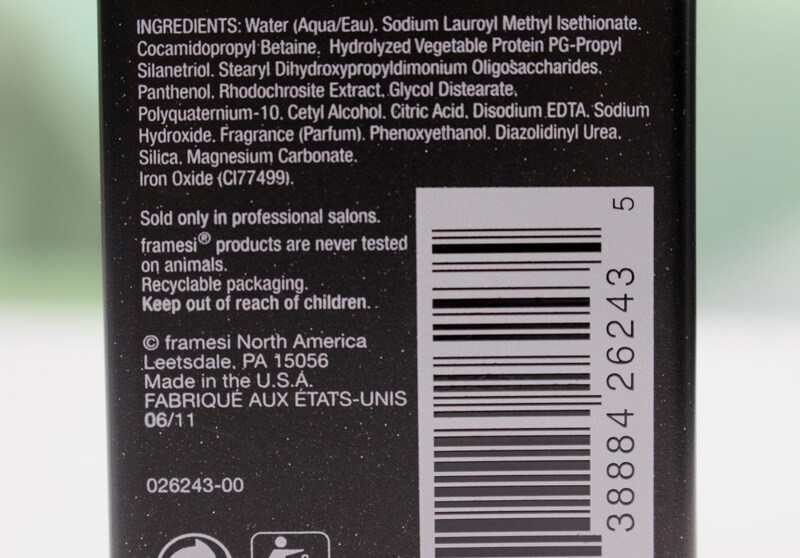 BY Sulfate Free Shampoo by Framesi comes in a sleek black bottle that is easy to use. The shampoo has a rich silky consistency and pleasant sweet scent. Unlike many other sulfate free shampoos Be Yourself Sulfate Free Shampoo by Framesi lathers very well and cleanses my hair nicely, while leaving it feeling soft. Depending on how much styling oils and products build up I have on my hair, sometimes I feel that I have to re-apply and rinse twice, but in most cases this is not the case. I was not able to see a full effect of using sulfate free hair products because I only used a sulfate free shampoo following with my regular conditioner and a mask. I can`t just use a shampoo on my damaged hair, so using all three products is always a must for me. However I noticed that my hair dried with less frizziness. I would recommend a sulfate free shampoo especially if you have a dry and/or color treated hair and using clarifying shampoo once in awhile will help to prevent build up formation. Be Yourself Sulfate Free Shampoo by Framesi is also very safe to use. 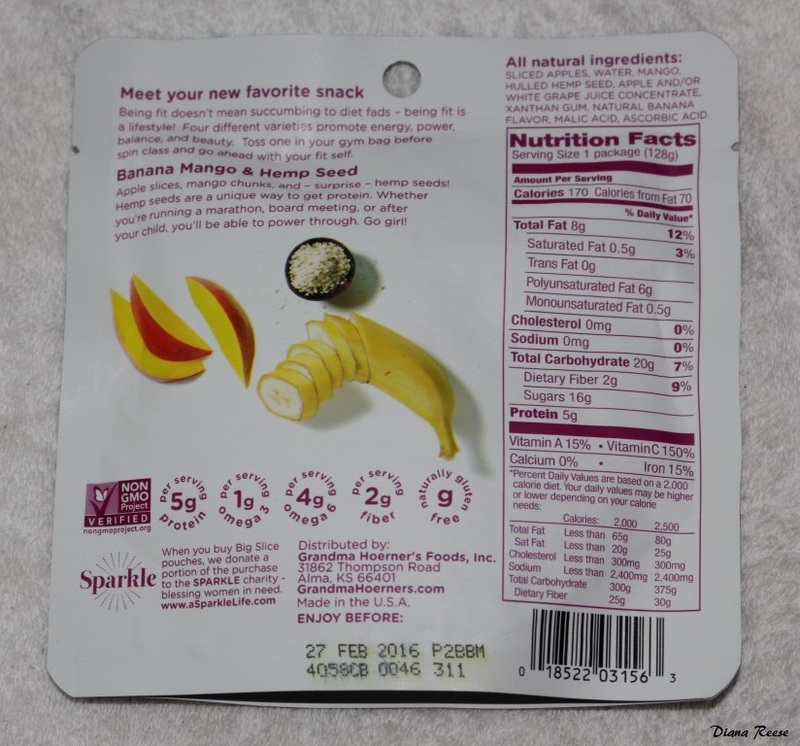 Copy the ingredients above and paste them on CosDNS to check the safety level of the product. PR Sample. All Opinions are my own and 100% honest. I would never recommend anything that I don`t like or use. Who does not like learning something new every day? I know I do and that is why I was curious in trying StudyX which is an easy study software that helps you learn facts faster and retain them longer. StudyX is easy and fun to use software that provides over 30 million study files available for free via download. Save money – Install on up to 3 computers or laptops. 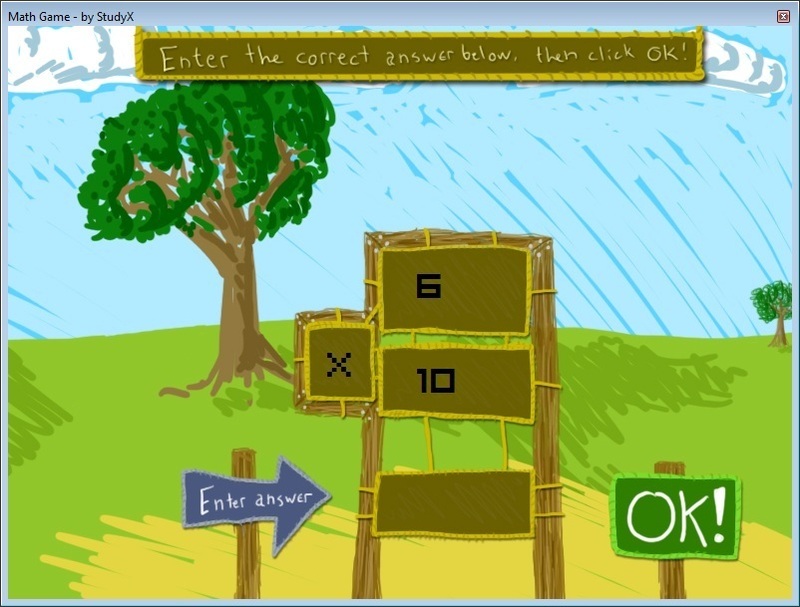 Have fun, save time – interactive study games combined with our smart-learning platform and the ability to Study while you browse the web! StudyX kindly gave me a key for a full version of the software to giveaway to one of my lucky readers. All you have to do is follow this blog and leave me a comment bellow what would you like to learn more about? I have recently received a box with a big “Made in USA” sticker on it, and when I opened it, it felt like Heaven here. 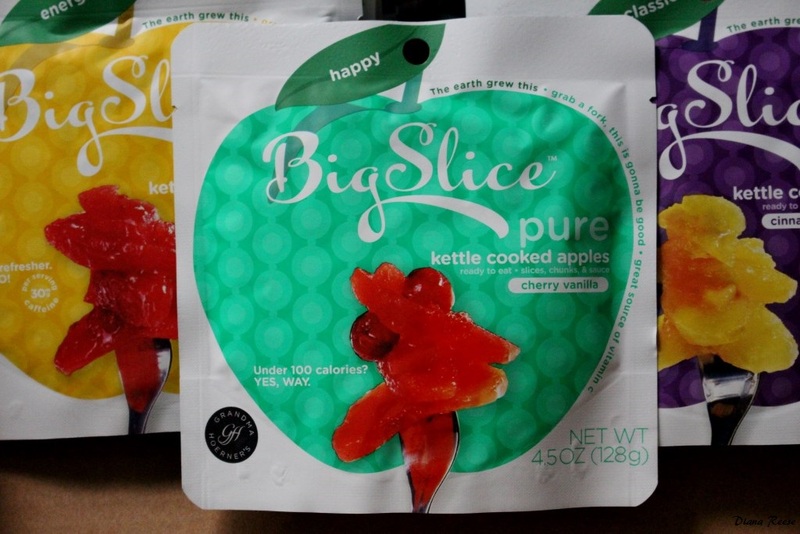 There were 8 different flavor pouches of Big Slice Apples by Grandma Hoerner. The packaging is so fresh and colorful and I could not wait to open and try them all. 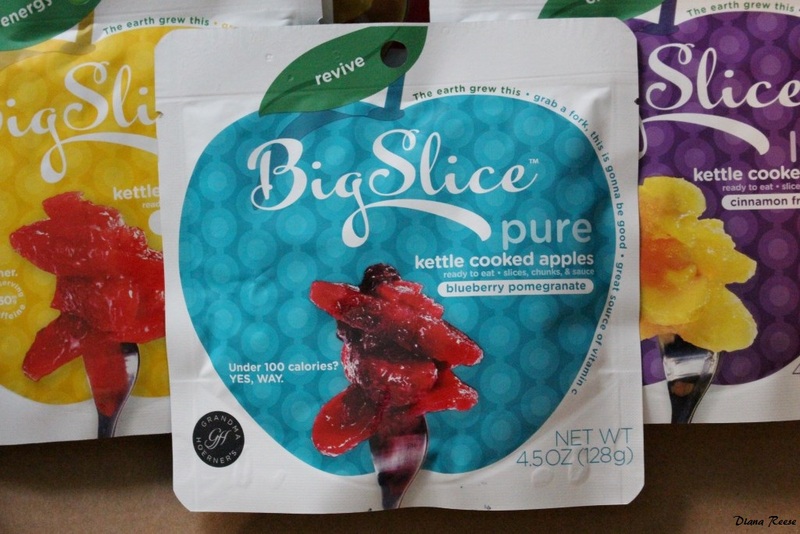 What the company has to say about their Big Slice Apples: We’ve cooked up something pretty special to share with you. 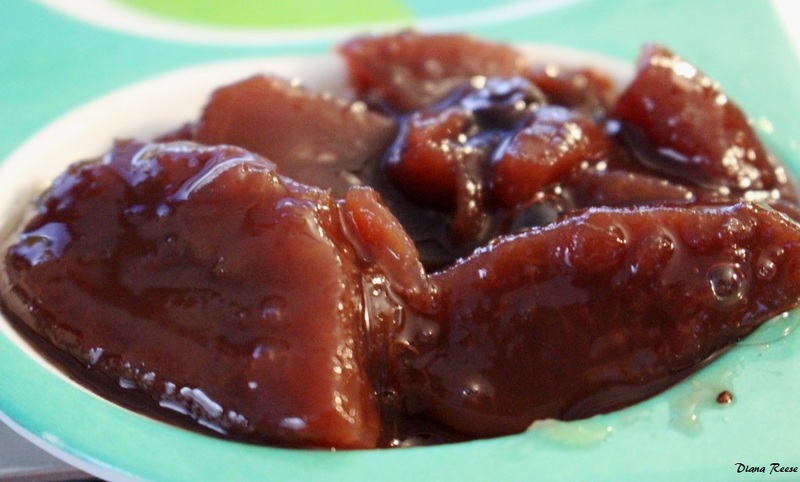 We started out making apples, big chunky slices slowly cooked in their own naturally sweet sauce, and then we had a groundbreaking idea. 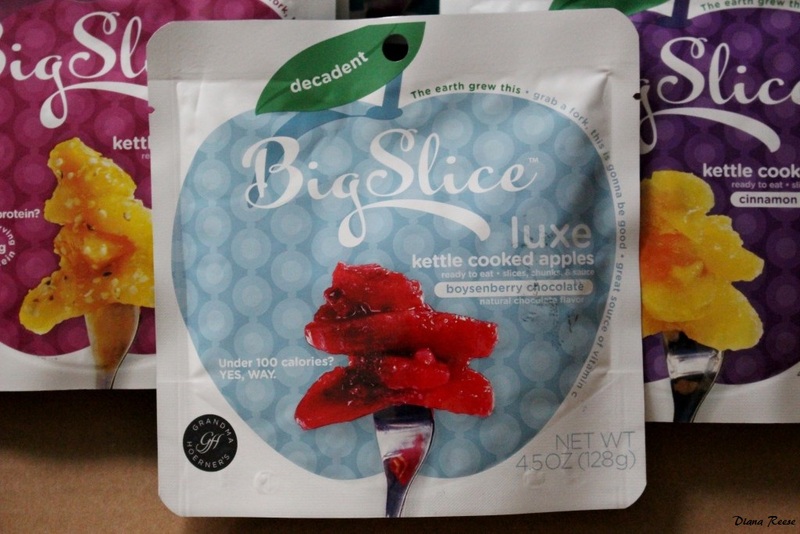 We put them in an on-the-go pouch, capturing all that rich, natural goodness and flavor of Grandma’s best in an industry-disrupting package. 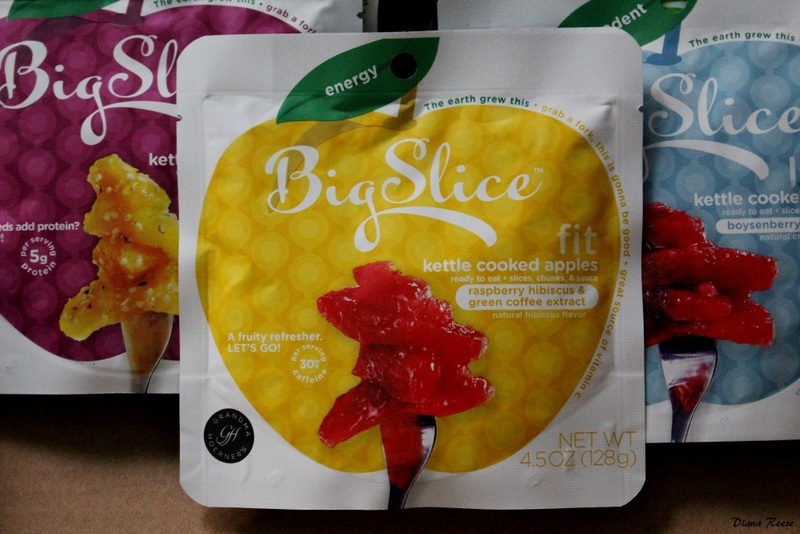 When you buy Big Slice pouches, we donate a portion of the purchase to the Sparkle charity – blessing women in need. 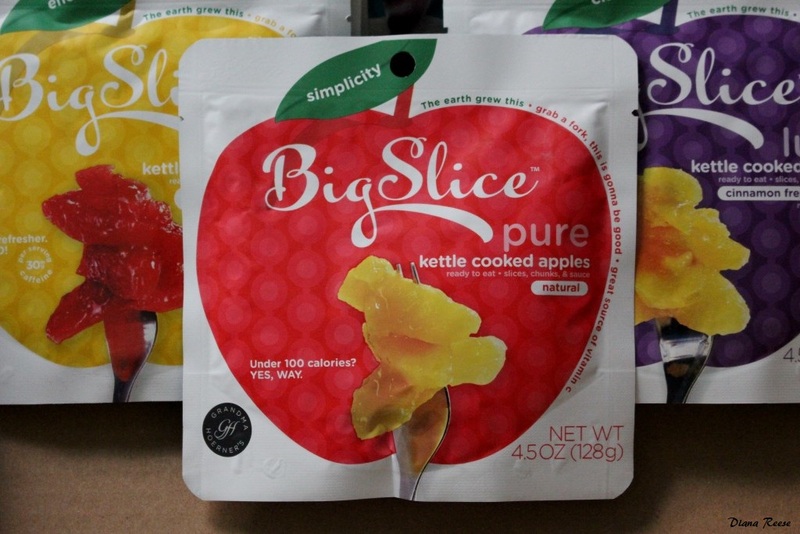 Big Slice Apples are available in 16 amazing flavors in 3 different collections: pure, fit and luxe. 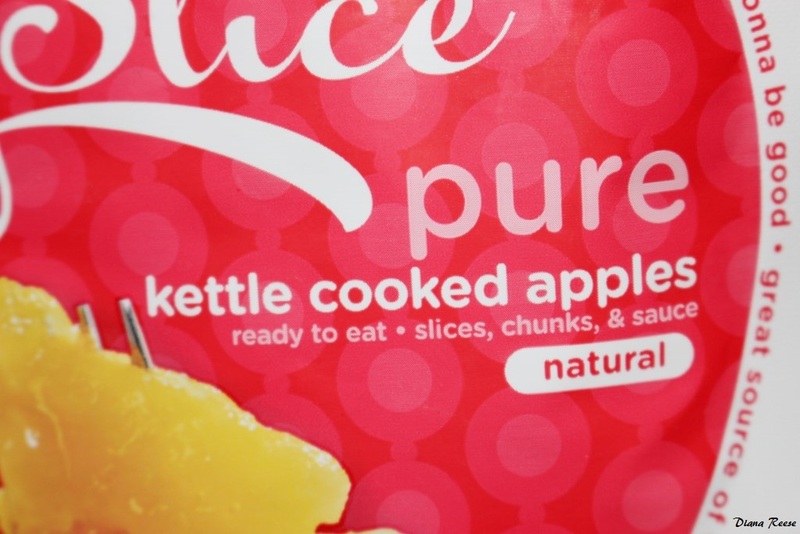 Our Pure line was made with just one goal in mind – we wanted to create something simple and delicious. Amazing on Greek yogurt, granola, or all by itself, each recipe is made with pure fruit and spices gently blended together. If it was any more naked, we’d be handing it a bathrobe. 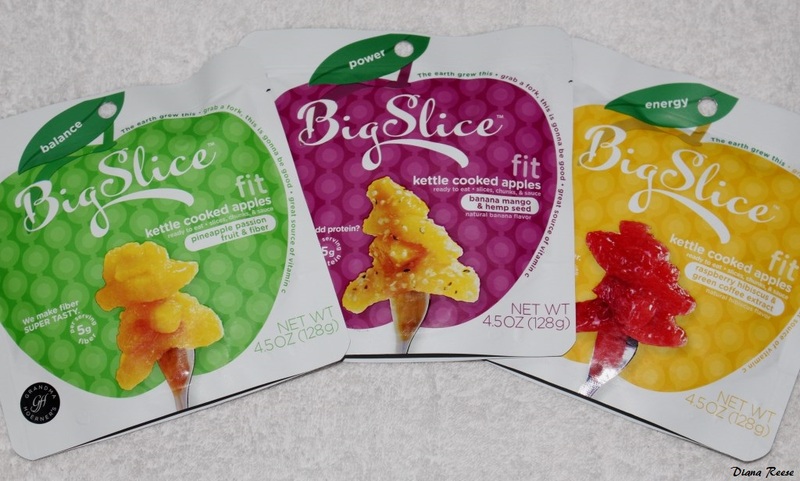 The Pure Collection contains 7 flavors: Orange Ginger, Apricot, Natural, Blueberry Pomegranate, Lemon Berry, Chai, Cherry Vanilla. NATURAL – Real. Pure. Bliss. 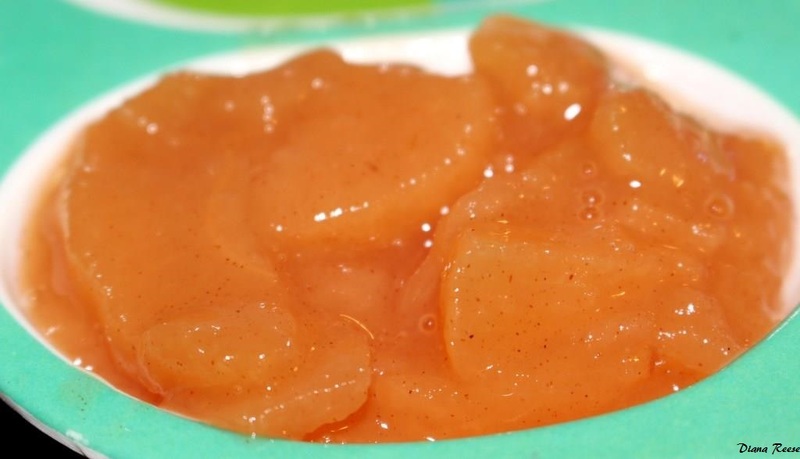 Perfectly cooked apples. Simply amazing – just like you. 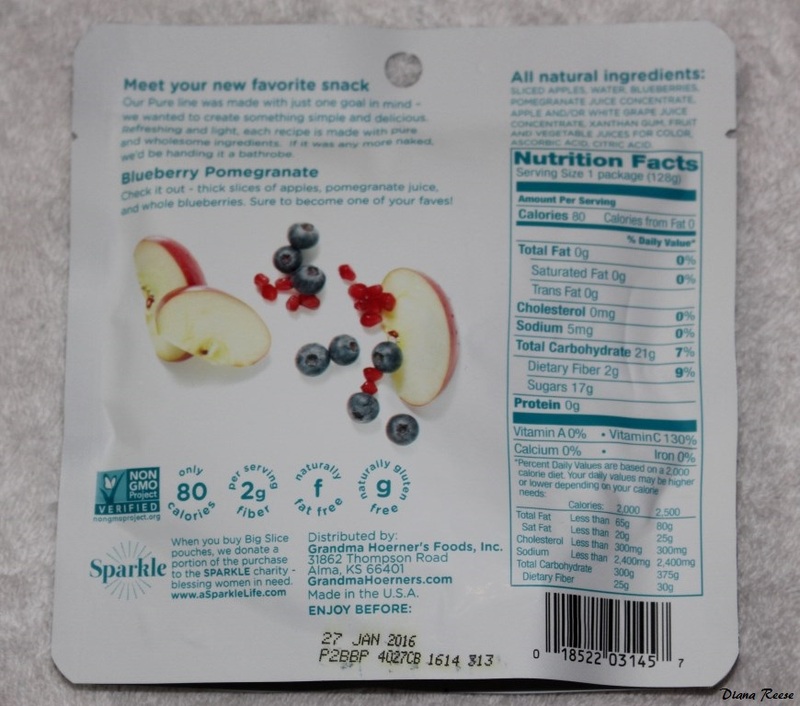 BLUEBERRY POMEGRANATE – Check it out – thick slices of apples, pomegranate juice, and whole blueberries. Sure to become one of your faves! 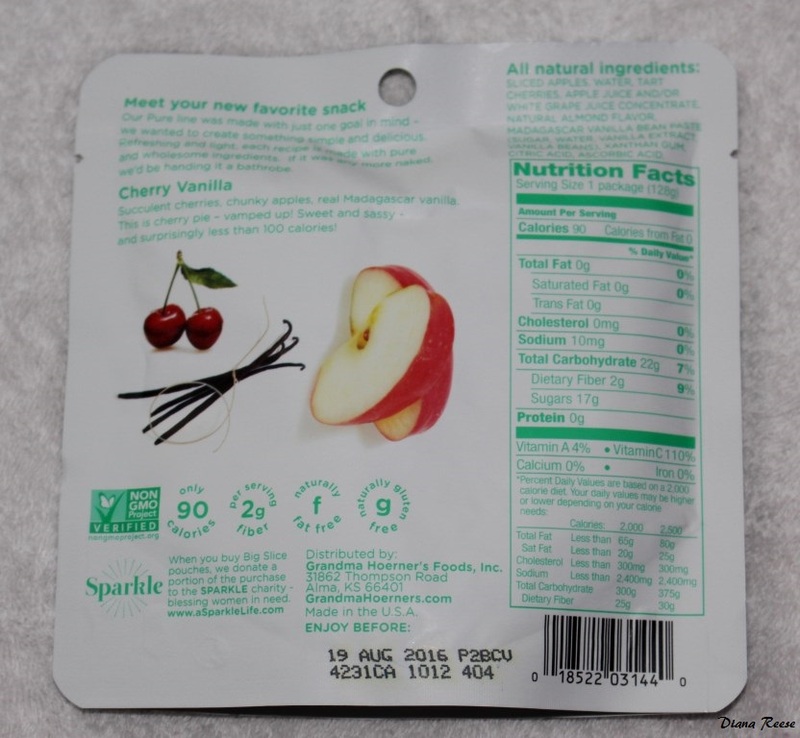 CHERRY VANILLA – Succulent cherries, chunky apples, real Madagascar vanilla. 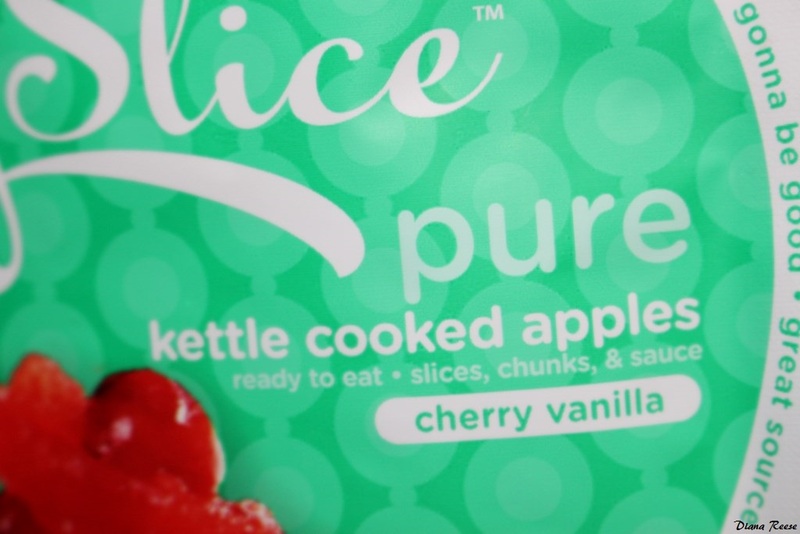 This is a cherry pie – vamped up! 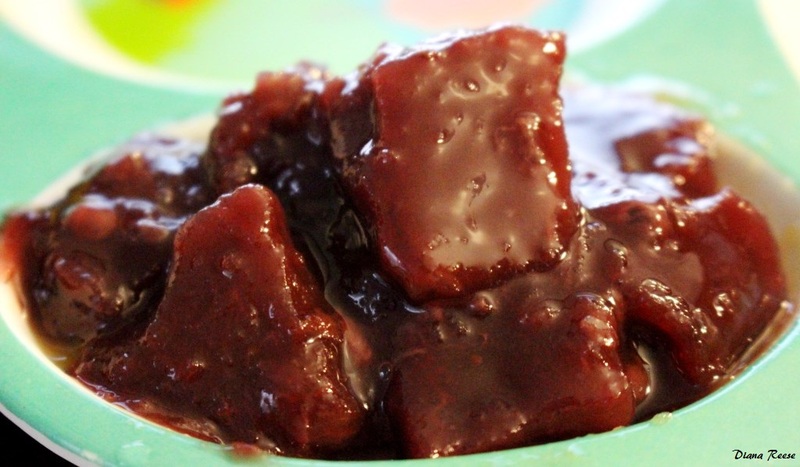 Sweet and sassy – and surprisingly low calorie too! Being fit doesn’t mean succumbing to diet fads – being fit is a lifestyle! 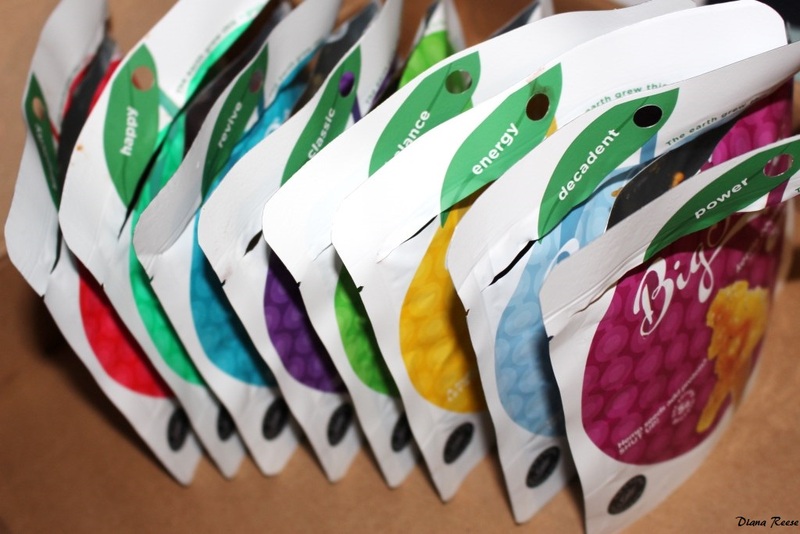 Four different varieties promote energy, power, balance, and beauty. Toss one in your gym bag before spin class and go ahead with your fit self. 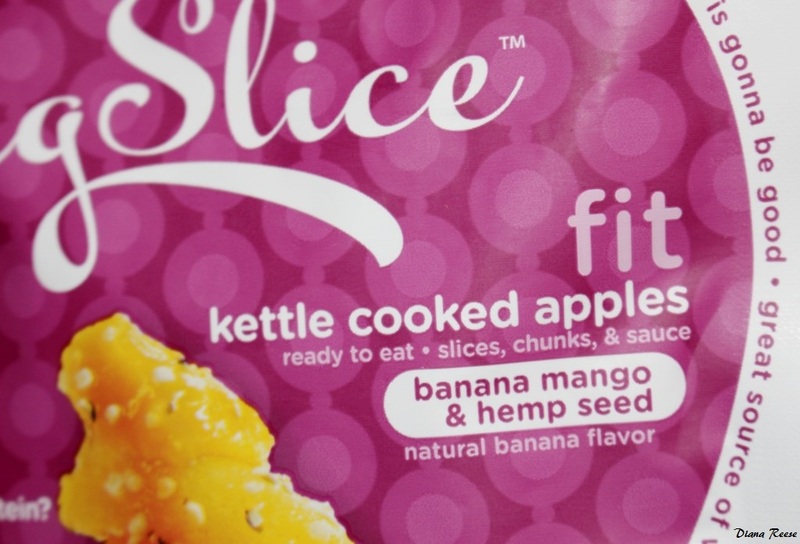 The Fit Collection contains 4 flavors: Banana Mango & Hemp Seed, Peach Green Tea & Aloe, Pineapple Passion Fruit & Fiber, Raspberry Hibiscus & Green Coffee Extract. 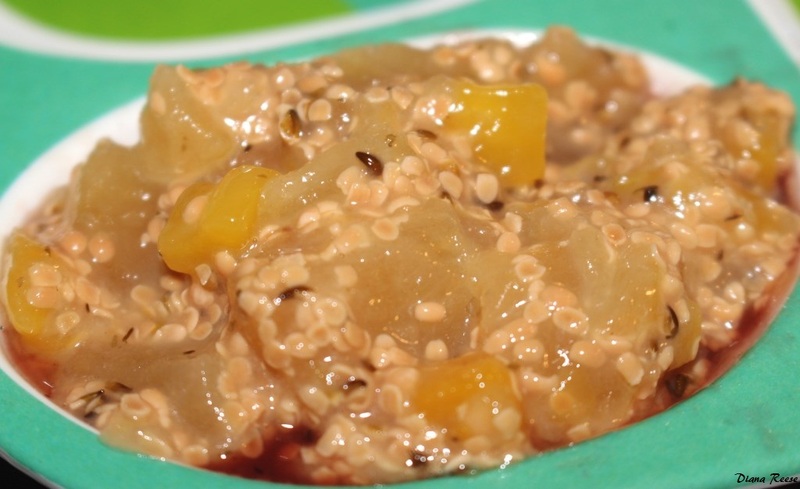 BANANA MANGO & HEMP SEED – Apple slices, mango chunks and -surprise- hemp seeds! This is your perfect protein! Whether you’re running a marathon, board meeting or after your child, you’ll be able to power through. Go girl! 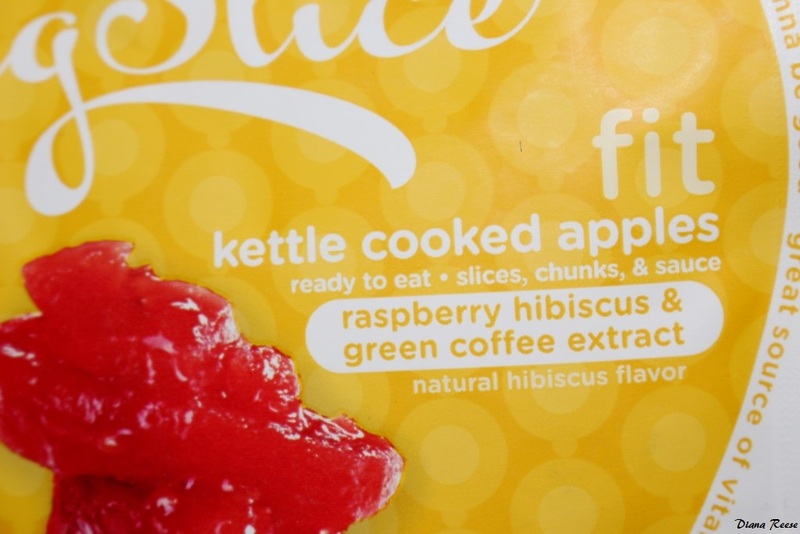 RASPBERRY HIBISCUS & GREEN COFFEE EXTRACT – Wow! 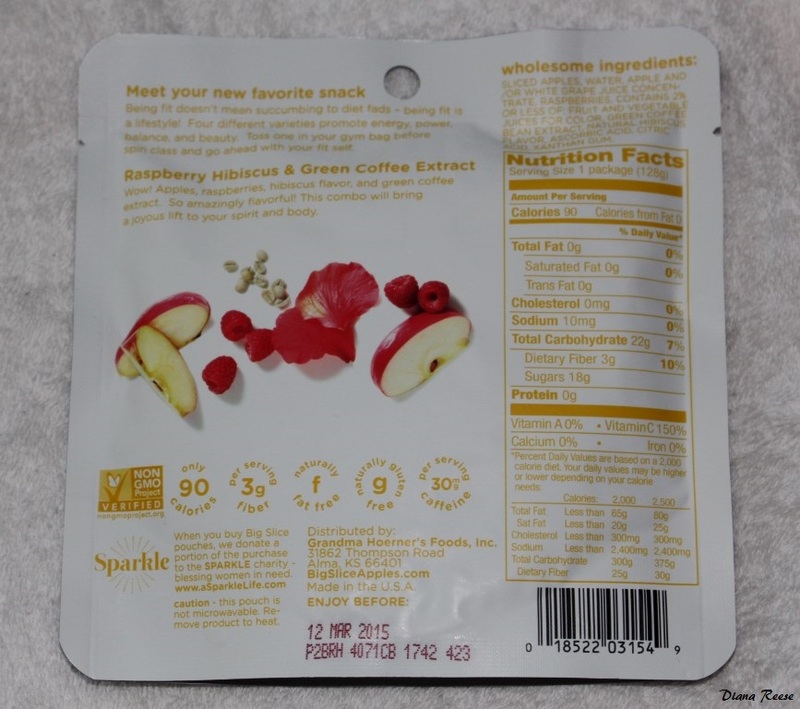 Apples, raspberries, hibiscus and green coffee extract! So amazingly flavorful! This combo will bring a joyous lift to your spirit and body. 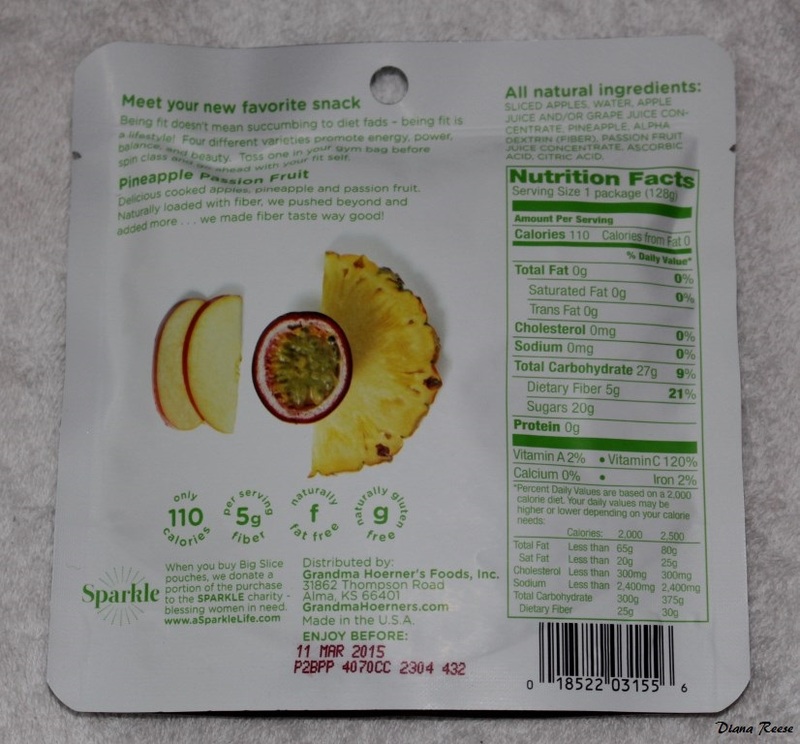 PINEAPPLE PASSION FRUIT & FIBER – Delicious cooked apples, pineapple and passion fruit. They are all super high in fiber already. We pushed beyond and added more. 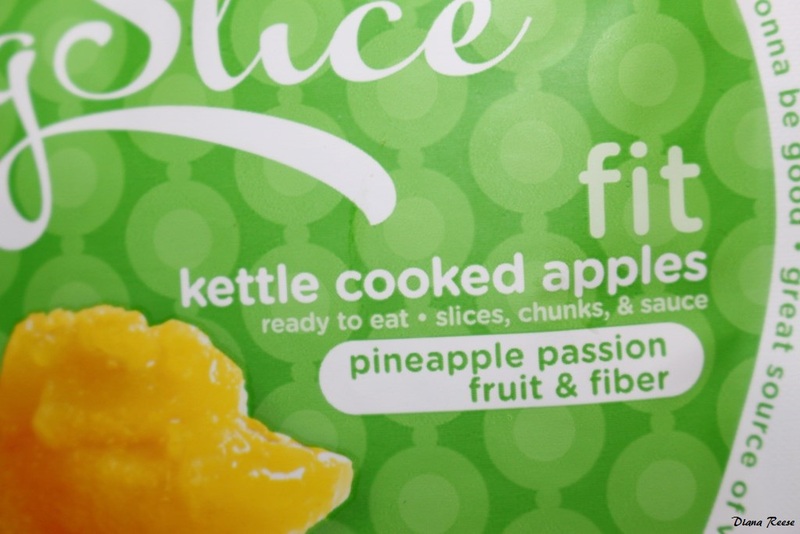 We made fiber taste way good. 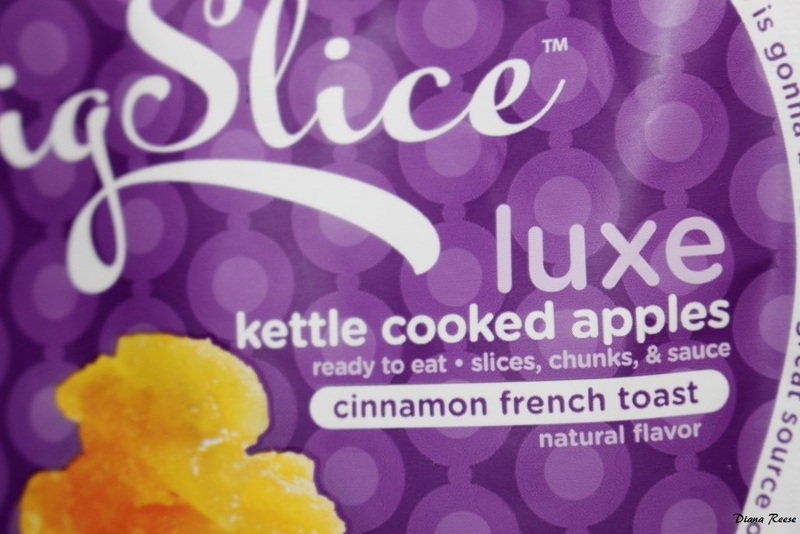 When it’s time to indulge, reach for a snack from our luxe line. Rich flavors and pure fruit. Decadent AND healthy? Yup, congrats! 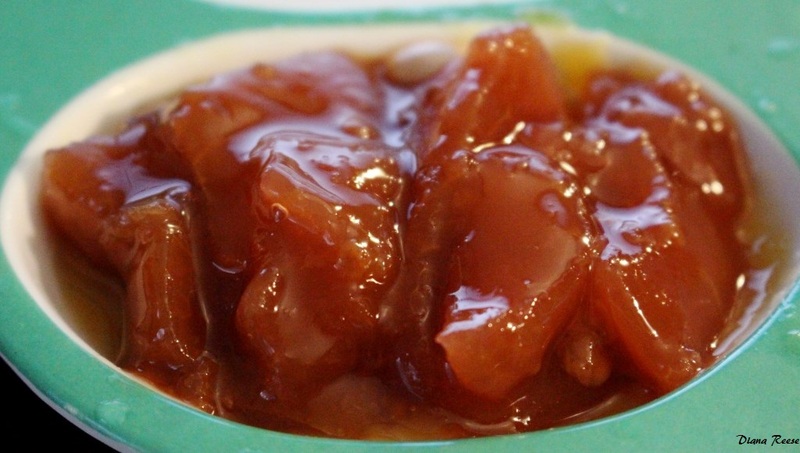 You’ve just found your new guilty pleasure, minus all of the guilt. 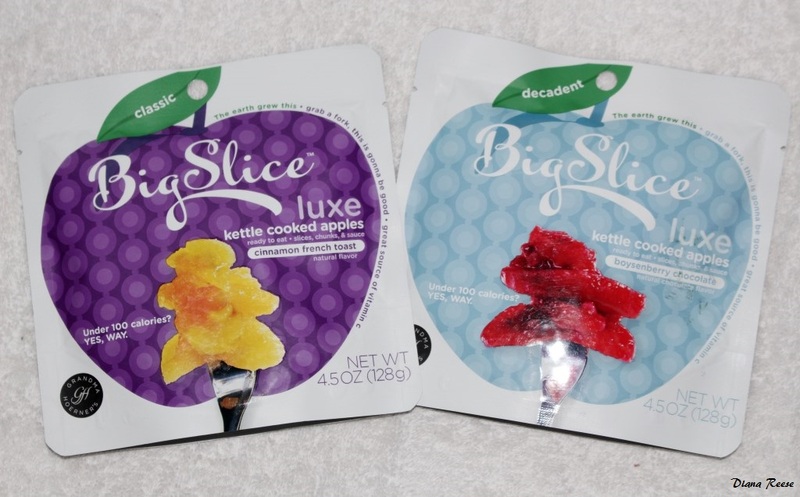 The Luxe Collection contains 5 flavors: Peach Bellini, Cinnamon Candy, Boysenberry Chocolate, Cinnamon French Toast, Caramel. 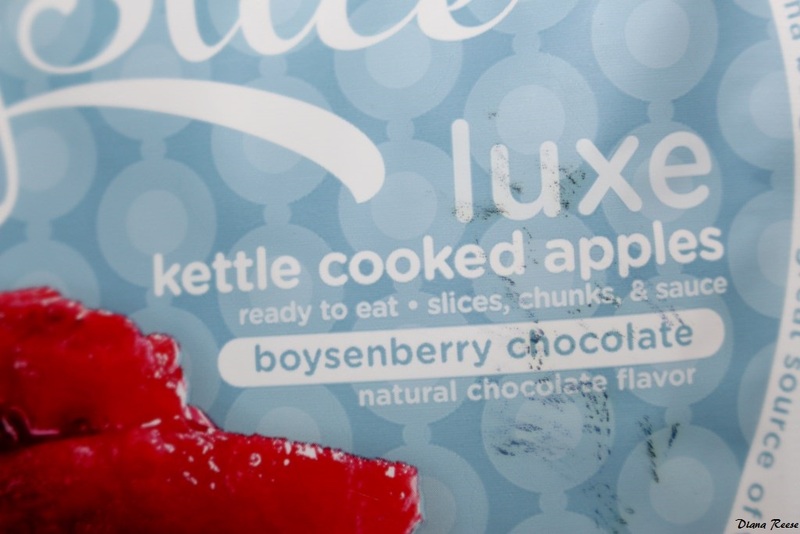 BOYSENBERRY CHOCOLATE – The richness of boysenberries, chocolate fudge and apples mingle to satisfy your sweet tooth. 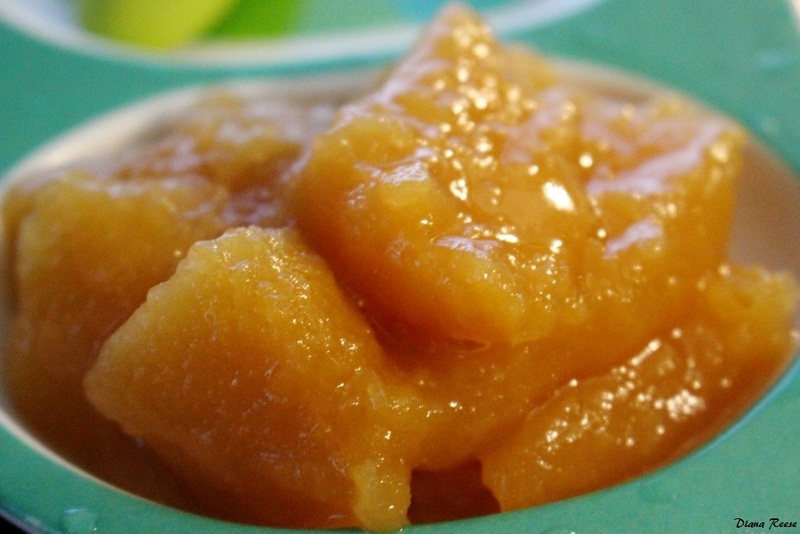 Totally guilt-free – this is one treat your body will thank you for! 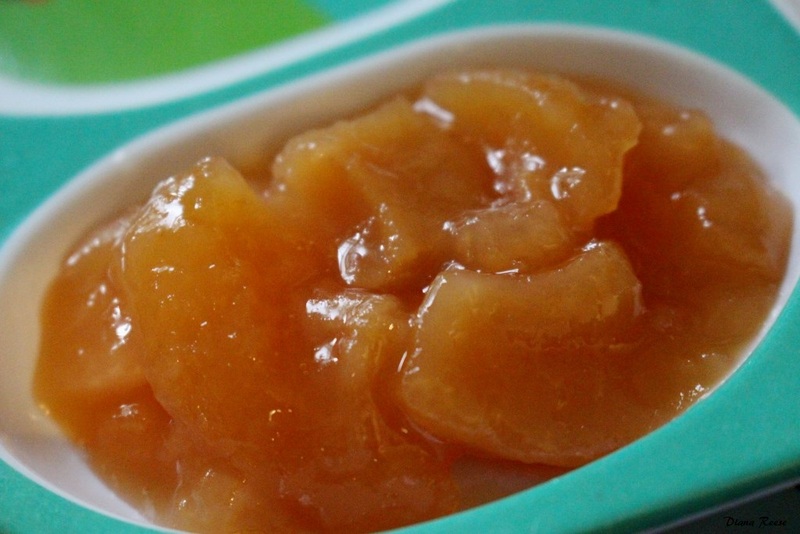 CINNAMON FRENCH TOAST – Apples, natural fruit juice, and a smidge of brown sugar transcend the ordinary. The ultimate healthy comfort food. All the indulgence of its namesake at a fraction of the carbs! 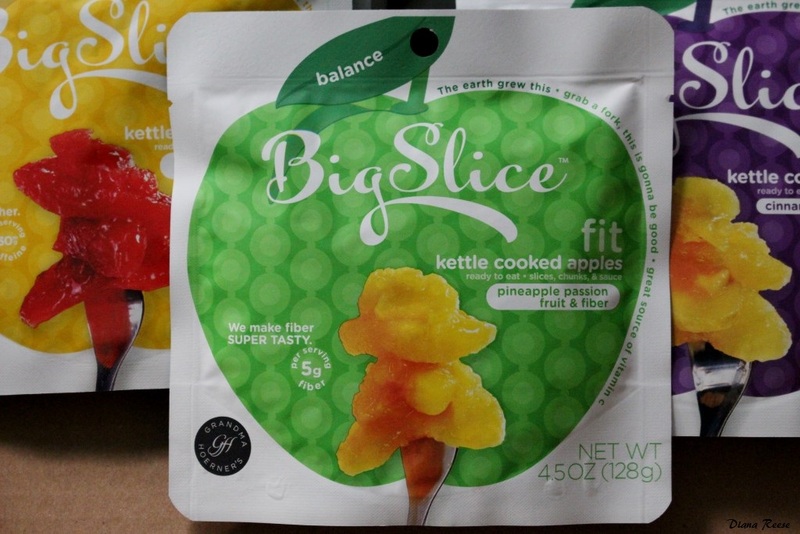 Big Slice Apples by Grandma Hoerner is the perfect on-the-go healthy and amazingly delicious snack. Each pouch was so fresh and tasted unique and full of flavor. 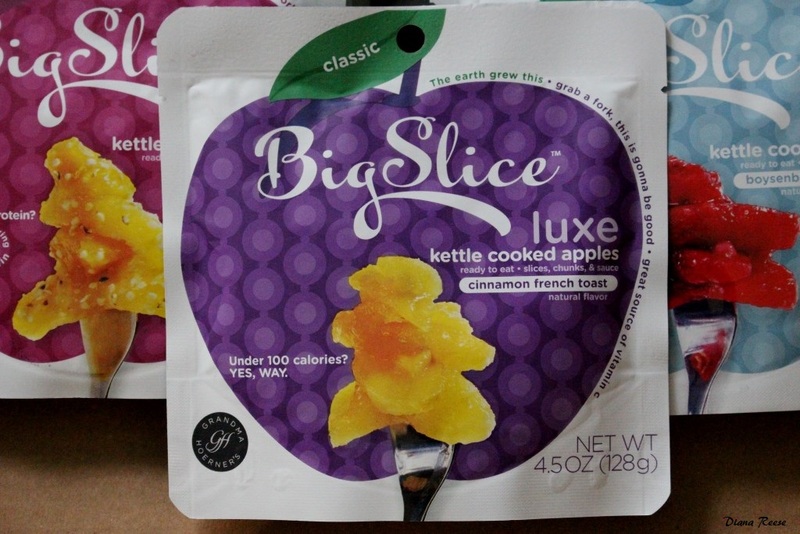 I wish I had unlimited Big Slice Apples. I could eat them all day every day forever 🙂 They are probably the best healthy snack I have tried. Honestly! 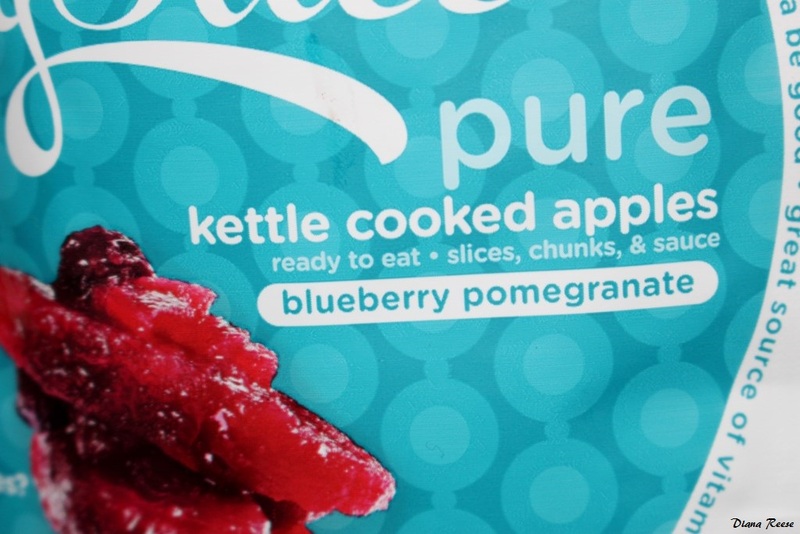 I am addicted to them and can not wait to try more flavors and purchase again the once I tried already. I would highly recommend everyone to try them at least once in their life, but be careful because they taste fantastic and are very addictive. 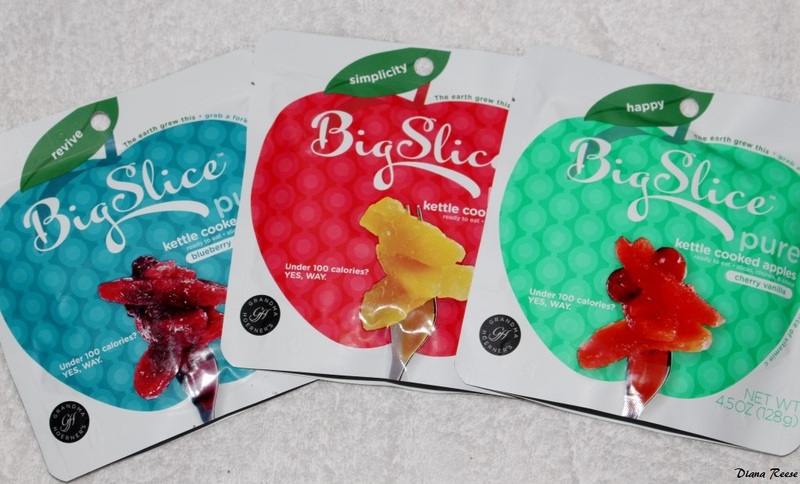 Each pouch is 4.5 oz/128g ($2.50) and they are also available in sharing size of 19. oz/538g ($5.95) jars. 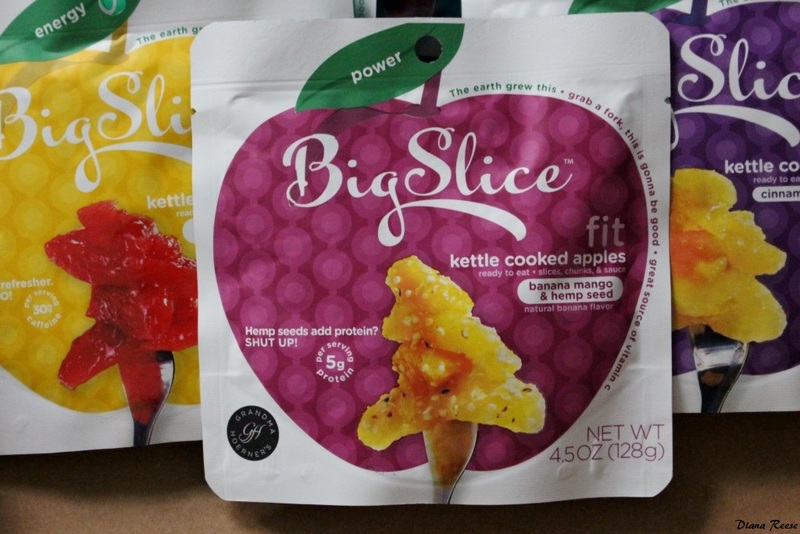 You could take Big Slice Apples by Grandma Hoerner anywhere with you. The only thing I wish it was different is the packaging. 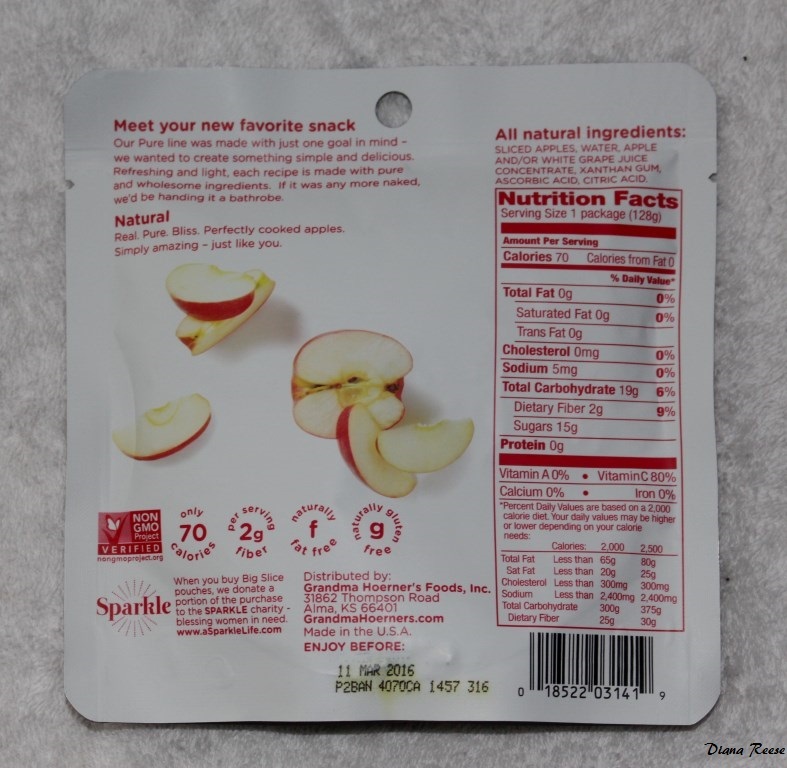 I think that these apples are great snack for my 2 year old and when I opened a pouch while we were at the park, he ate a little bit and wanted to save the rest for later. 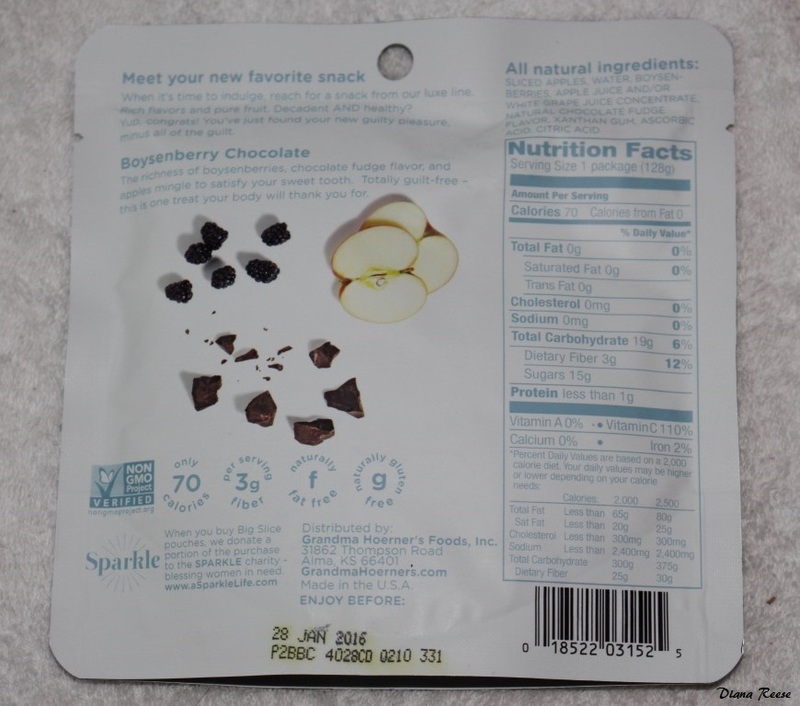 Unfortunately (for him) I had to eat them, because the packaging is not resealable and it does not allow to reclose it. Availability: Select Target and Grandma Hoerner’s home webpage. 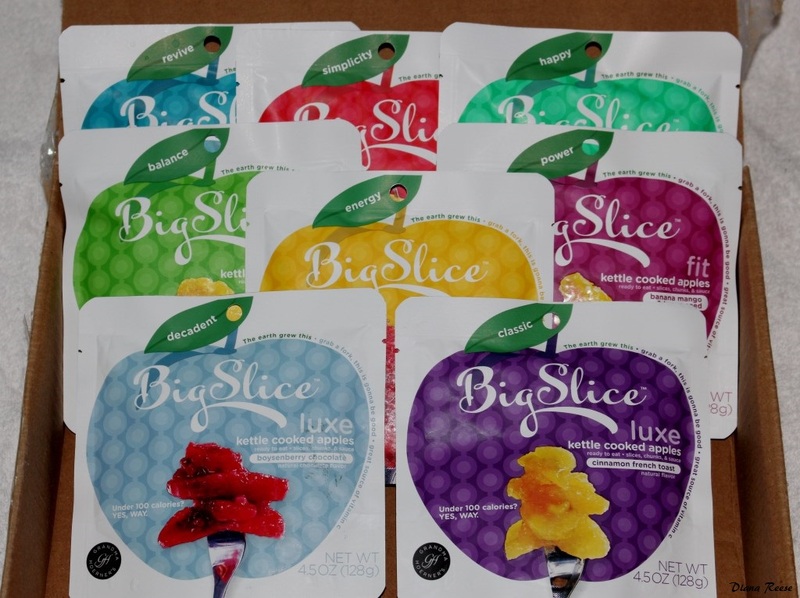 If you would like to win your own box with 8 different flavors of Big Slice Apples by Grandma Hoerner, all you have to do is follow this blog, Subscribe to my YouTube Channel, Like my Facebook Page, Like Big Slice Apples Facebook Page and write on their timeline that Diana Reese sent you. Giveaway ends Dec 8th. Good Luck. Memebox was so kind for letting me host a GIVEAWAY in which everyone wins. There will be One first place winner who will receive thirty meme points (equivalent to one $23 box + shipping) and Two runner up’s will receive seven meme points each (equivalent to the price of standard shipping). Participants MUST sign up for an account with Memebox and include complete shipping details. The direct link to the signup page is here. You must also sign up for the newsletter, otherwise Memebox will not be able to send notifications to the winners! Duplicate accounts are no permitted. Memebox reserve the right to reject any participant that had an account with Memebox prior to the giveaway. Subscribe to my YouTube channel here and leave me a comment under this post what is your YouTube user name, so I can verify and choose the winners. Open to all countries that Memebox ships to. This Giveaway ends October 20th, 2014. All signups will receive three meme points to spend on future purchases (and if they happen to win, they will keep the three points in addition to the prize points!). Take $5 off ANY order IYQN Expires 10/31/2014. Click here. Take $5 off your purchase of 3 boxes or more MEMEBUNDLE3. Take $8 off your purchase of 4 boxes or more MEMEBUNDLE4. Get free shipping on orders above $70 from Memeshop FREESHIPPING. Check out all of my Memebox Review here.